There is often a common point of recollection in childhood memories – particularly the kind found in articles and autobiographies. It is the recalling of a mother or significant female relative dressing up ahead of an evening. The events acquire an almost ritualistic quality with the application of make-up, the choosing of a dress and the brushing and arranging of hair. These memories are usually sensory, filled with the warm scent of perfume or glimpse of a spangled brooch under lamplight. Such small details preserve the scene, made vivid by the author’s words. Edmund de Waal’s book ‘The Hare with Amber Eyes’, as well as several pieces in Vogue and the Guardian come to mind. Reading them makes me think of occasions watching my mum preparing for a party or night out. Although what doesn’t often make its way into the nostalgia-soaked moments are the frantic calls of, “Where’s my bloody handbag?” and “Come on, we’re late!” It would, of course break the cosy elegance. I also have photos of my mum at various fancy dress parties: Rapunzel, Cleopatra and a costume based on a variation of my then twelve-year old attire for a ‘Mutton Dressed as Lamb’ themed party (the outfit involved a baker-boy hat and a denim mini skirt)! The dress pictured above was worn to a vintage ball that took place in a local stately hall. I was asked to document the evening, and turned up with my camera (complete with a heavy flash) in one hand, and a vintage evening purse in the other. The guests were greeted at the entrance with a glass of champagne, and I slunk among the groups, snapping all the time. It was an incredible sight: coral-tinged ball gowns mixing with chiffon flapper dresses and lace fifties concoctions. It was as though the revellers had emerged from a tangle of decades. But my favourite couple, and the ones who fascinated me most, eschewed traditional glamour in favour of WWII uniforms. They had matching khaki caps – and their buttons caught the light from the chandelier. If one talks of ‘hunting ground’ for photography, then this one was immensely fertile. Every turn of my gaze yielded new sights. What struck me again and again throughout the evening was the intense vitality of everyone I observed and spoke to. An elegant couple – she in sequins, he in a white dinner jacket – swept past my lens, while a mother and daughter later tapped out the Charleston. A floor view would have revealed leopard print heels tango-ing past low, patent t-bars. To see the events through a viewfinder – dividing it up into single photos and snapshots – was to try to squash the exuberance and enjoyment of the evening into a rectangle. Thus, the following images are a handful of single moments, snatched from a fabulous few hours. My mum bought the vintage satin evening dress for me for Christmas (from a local flea market) because it reminded her of “the Atonement dress”. That particular dress has achieved near mythical status, and so I was thrilled to find this similar emerald green item relaxing under the tree. In homage to a thirties Cecilia type I wore it with faux-pearls and gold t-bar shoes – with my hair pinned with hair clips as it was drying so that it fell in waves. The photos were taken by my dad the following day, as I spent the entire night of the ball behind the camera - and forgot to ask anyone to take a photo of me! 'Ritual' is most certainly the correct word to describe preparing for a dance or ball such as this. I for one always allow more time than necessary to get ready purely for the enjoyment of putting on the dress and shoes, styling my hair extra specially, applying make up and adding jewellery and perfume before facing the mirror and turning this way and that to admire my handiwork! We are all guilty of this little vanity I suppose. 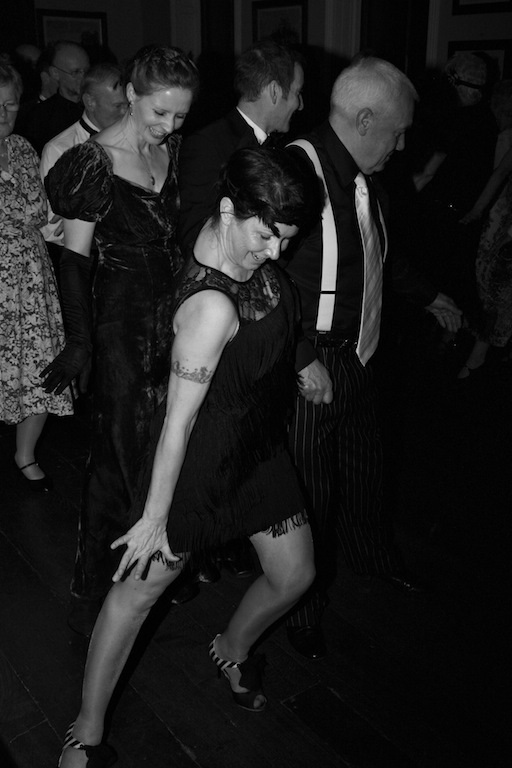 I only wish there were more occasions for dressing up like there were in the past at dance halls and so on. I think one of the main attractions, for me, of period and costume dramas such as Downton Abbey are the vast array of beautiful costumes on show as at the time dressing for dinner was the norm! It's a very pretty dress, glad that you got it documented in the end. Dressing up and pretending to be someone else, just for a night is always so fun and it's great to see that all those people in photos were creative with their...should I say - costumes? I know the sort you mean-- I always love reading these types of memories, but I tend to find them in books written many years ago, or from the point of view of an older person remembering their own childhood. People don't dress up anymore!! They (most) don't really take the time and care they used to. It's really sad. We've just gotten so casual. Once again a beautiful piece of writing, I really enjoy reading your work. A gorgeous dress as well, sets off your height wonderfully. The dress is really flattering and you look absolutely stunning. Totally spellbound by how glamorous you look in that dress! What an absolute gem. Stunning. And even more stunning in front of a barn. The contrast is haunting and so right. The soft delicate dress looks like a dream in that backgroud. You mother gave you a perfect gift, Rosalind: a dress with a story behind. Much love and admiration always,my dear friend. I was absolutely going to say that this looks like the Atonement dress! I don't really have many memories of my mother properly dressing up--she did/does from time to time, but my main thoughts were always how the perfume in her make-up make me extra-carsick. I've attended a lot of Scottish dancing balls and find them simultaneously beautiful and a little sadly anachronistic. But I remind myself that balls still do have a place in the modern world... perhaps as much as they ever did, and at least in this decade I can go to them if I wish. Lovely photos from the night! Stunning photography, those couples are enchanting. Wow....it must have been a wonderful evening! So many colors, so many textures, so many silhouettes, so much for the senses to revel in! You look so beautiful that I can't stop staring at you! Holy smokes- just when I think that I love ya for that gorgeous face, remarkable model's frame, or graceful sense of style, I become distracted by your talents- the photographer's eye, and your immensely incredible way with words. Turns of phrases curl into a palpable vignette: "the warm scent of perfume or glimpse of a spangled brooch","nostalgia-soaked moments," "It would, of course break the cosy elegance," etc. Then the photography- the captured moment, the hint of portrait in your dancehall images. For some reason the one of the couple dress up in military regalia struck me as poignant, I'm not sure why, but I felt a bit of tear in my eye, a drop of melancholia- perhaps my newly acquired sense of maudlin sentimentality got triggered. But I am wowed relentlessly when I visit this blog- so much to cherish beyond the facade of fashion, and I can't wait to be moved/awed another time. oh, it's all so amazing! thank you for sharing, roz. i like the images in black and white, for there is an air of sophistication, mystery glamour and revelry. as for you - incredible! As the mother of a 24 year old artist and writer, I often wonder what she would say about her memories of me back in the day getting ready for a gig (I was a singer back then). I still have events that require getting dolled up, and I enjoy the process for the most part. Your green gown is delicious and looks so lovely against the backdrop of the barn. I love the photos you took, as well. Poignant and enchanting. I admire your parents and appreciate the glimpse of them that you provide. They must be very proud! You are absolutely right about the evening out rituals and the memories they entail. I still miss seeing my mother in front of her dressing table, perfumes and lipsticks scattered about while fastening the last clasp of her jewelry. I don't think I approach anywhere near the elegance of her moments, since my routines these days are more frenetic, and resemble the "where's the bloody handbag" rigmarole. Actually, who am I kidding? I haven't really dressed up in weeks since I went into Cinderella (scrubbing and cleaning) mode! Such a dramatic dress! Love the colour. That's so funny you mentioned Atonement! You strongly reminded me of that character and not even because of the dress (or perhaps subconsciously I picked up on that since consciously I didn't remember the dress from the film or the book) but in your expression. You really channeled something from another decade. Lovely photos and your change in tone in the first paragraph made me laugh. I also loved the last picture particularly. It reminded me of a Toulouse Lautrec pastel drawing of a wild cabaret in Paris. Great post as always! that green dress is gorgeous! Hello! I'm your newest follower after my friend the Citizen Rosebud told me about your blog. I can't wait to read and see more! Your images are so wonderful and honestly that is the type of photos I aspire to, but I am having so much trouble with lighting. My images are so over-exposed and washed out, though i never use a flash. Would you be so kind as to let me know, what settings you use and type of camera? Do you have someone who takes them for you? I'd love to learn from you. Please give me some tips if you can. I want my blog to be fun again not a chore to get my photos good. what a gorgeous dress !!! you look stunning in green, I love it !! I would like to say thank you to you for your nice comments each time. it's a real honour for me te have your comments. i consider you as a real inspiration for me and my blog. Each time your pictures are perfect and you look like a godness, so thnak you for your comments and have a great day !